Background: Soviet occupation following World War II led to the formation of a communist “peoples republic” in 1947 and the abdication of the king. The decades-long rule of President Nicolae CEAUSESCU became increasingly draconian through the 1980s. He was overthrown and executed in late 1989. Former communists dominated the government until 1996 when they were swept from power. Much economic restructuring remains to be carried out before Romania can achieve its hope of joining the EU. 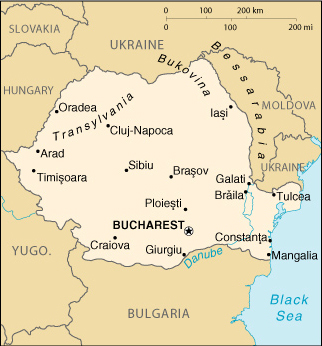 Economy – overview: Romania, one of the poorest countries in Central and Eastern Europe, began the transition from communism in 1989 with a largely obsolete industrial base and a pattern of output unsuited to the country’s needs. Over the past decade economic restructuring has lagged behind most other countries in the region. Consequently, living standards have continued to fall – real wages are down over 40%. Corruption too has worsened. The EU ranks Romania last among enlargement candidates, and the European Bank for Reconstruction and Development (EBRD) rates Romania’s transition progress the region’s worst. The country emerged in 2000 from a punishing three-year recession thanks to strong demand in EU export markets. A new government elected in November 2000 promises to promote economic reform. Bucharest hopes to receive financial and technical assistance from international financial institutions and Western governments; negotiations over a new IMF standby agreement are to begin early in 2001. If reform stalls, Romania’s ability to borrow from both public and private sources could quickly dry up, leading to another financial crisis.